Modest reductions in measles vaccination rates among US children are poised to produce an inordinate number of new cases of the disease, while increasing annual public health expenditures by at least $2.1 million, according to new research. User computer models, researchers from the Stanford University School of Medicine and Baylor College of Medicine have shown that a five percent reduction in measles vaccinations among children between the ages of two and 11 would triple the number of annual measles cases among this group. What’s more, the associated public health costs would run upwards of $2.1 million, or $20,000 per case of measles. These troubling findings were published earlier today in JAMA Pediatrics. No doubt. 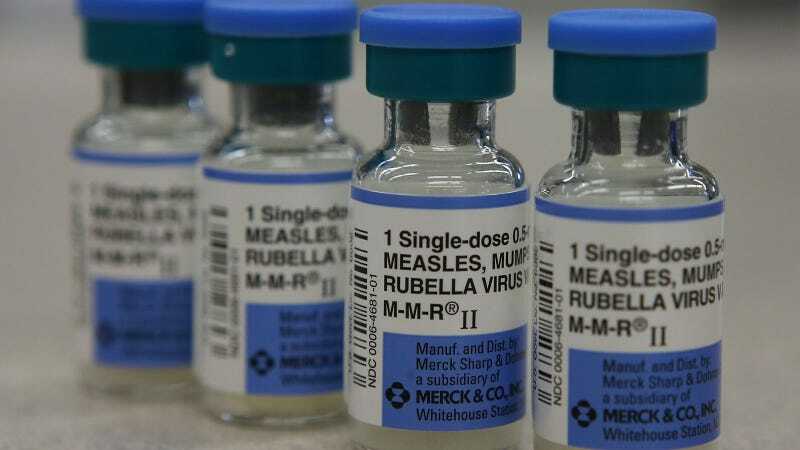 Several regions in the United States are currently flirting with the 90 to 95 percent vaccine coverage threshold required to prevent measles outbreaks, a group-wide level of protection known as herd immunity. With routine childhood vaccination rates declining in some parts of the United States, there’s an increased risk for isolated outbreaks, such as the one that struck an Amish community back in 2014. The new study predicts a sharp increase in measles within certain communities should vaccination rates decline much further. “I think our study is a wake-up call for what we can expect in the coming months and years as vaccine coverage rates continue to decline in the 18 states that now allow non-medical or philosophical belief exemptions,” said study co-author Peter Hotez. Measles, which starts with fever, coughing, and sore throat, is a highly contagious virus that spreads through the air. Common complications include ear infections and diarrhea, but around one in 20 children who contract the disease get pneumonia—the most common cause of death from measles in young children, according to the US Centers for Disease Control. Vaccinations have been largely successful at suppressing measles in the US, but a few dozen to a few hundred cases occur each year, typically when unvaccinated citizens travel abroad and unknowingly bring the virus back with them. Currently, all 50 US states require the measles, mumps, and rubella (MMR) vaccine and other vaccinations prior to enrolling a child in daycare of elementary school. Only three states allow parents to decline vaccinations for religious reasons, and as noted, 18 states have provisions for personal beliefs. Infants under the age of one cannot be vaccinated, making them particularly vulnerable to the disease. For the study, Lo and his colleagues analyzed MMR vaccination data provided by the CDC. They built a mathematical model to predict the effects of declining vaccination rates in children aged two to eleven. Around 10,000 scenarios were run through the model, all of them kickstarted by hypothetical travelers who returned to different locations in the country. Just keep immunizing your kids, folks. For them, and your community.